Multiple award-winning World Inspired Tents have bases in Bristol and Devon. They deliver giant Nordic tipis across Southern England, South Wales, the Midlands and beyond, so the setting can be wherever you want it to be! World Inspired Tents have pitched their tipis in family gardens, the grounds of stately homes, on beaches, in woodlands and in wildflower meadows. 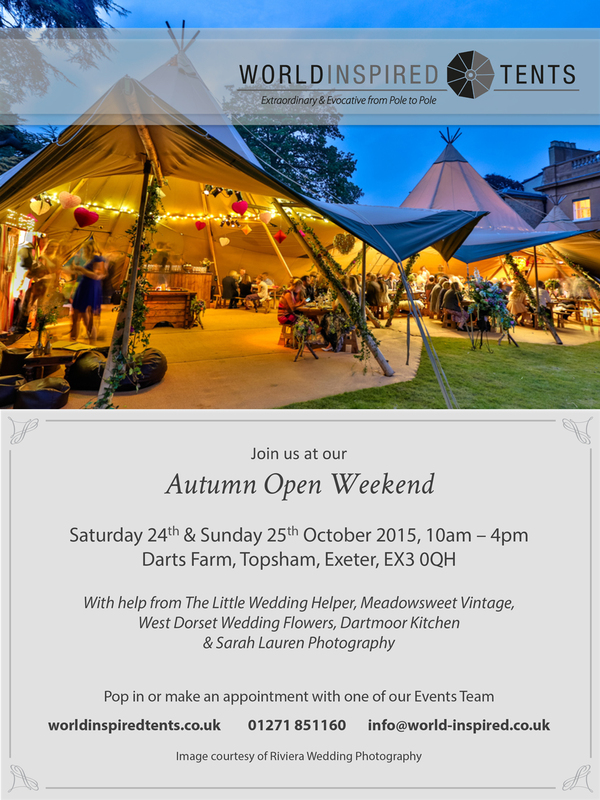 On Saturday 24th October & Sunday 25th October, you can see their magical giant Nordic tipis set up, furnished and lovingly dressed by some super suppliers (including The Little Wedding Helper, Meadowsweet Vintage & West Dorset Wedding Flowers, by the Poundbury Florist). The events team will be available all weekend to answer questions and show visitors around. For anyone wanting some dedicated time with one of the team they have appointments available throughout the day. Please call 01271 851160 or email info@world-inspired.co.uk for more information.